Freightscapes™ are fully wrapped tractor-trailers (48′ and/or 52′ in length) from top to bottom with pressure sensitive vinyl. The appeal of the medium is the opportunity to create a “virtual” fleet for your brand and/or product with the ability to spark artificial demand for your product. With our Freightscapes™ we’re able to offer a similar concept in a budget friendly mobile solution while still offering a medium that is not typically found by other vendors. 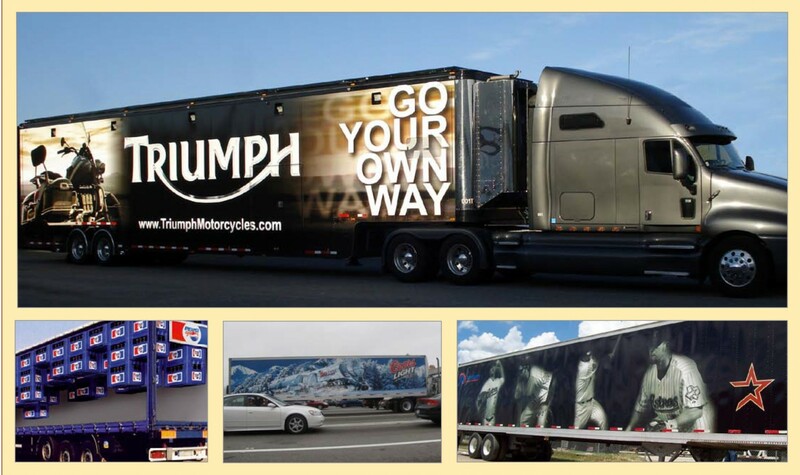 The Outdoor Link has contracted rights to wrap 1,000’s of independent tractor-trailers. These massive mobile billboards travel the freeways and surface streets of some of the United States most congested cities. A key highlight to our fleet is the fact that most of our trucks are furniture delivery contractors, for office supply chains such as Office Depot, Staples, etc. Market Routes . . .